The foundation of our success story was laid down by a solid retail presence globally. With over 600 retail stores and point of sales for Swiss Military in Europe alone, the brand has today grown from strength to strength to one of the most exciting and rapidly growing brands globally. Our store formats are replicated globally to give a similar look and feel to our brand so the customer can relate to the same brand experience no matter where across our presence. 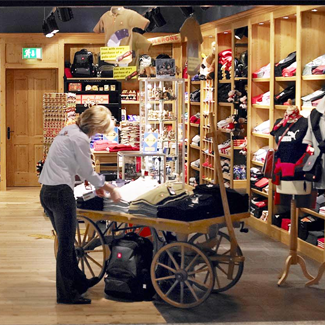 While designing our speciality stores or point of sale displays, extensive research is conducted in order to provide the best retail experience to the customer. The 'one stop shop' concept to provide a hard to resist temptation to everyone walking into our doorstep is the key to our store formats and designs.